"Strike" up some sizzling conversations with party revelers! Guests will know without a doubt that you are a "match" made in heaven when they see your trendy yet practical choice in favors. 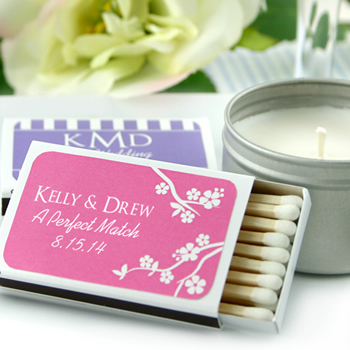 These super stylish personalized matchboxes will surely "light up" any occasion and "match" impeccably with any style. Planning an outdoor wedding... add small candles or sparklers.... celebrating a baby....go ahead and light the proud Father's cigar, the possibilities are endless! These matches and the box are great. The labels are attractive and make a nice touch. Would buy more from this company. Price and delivery were great. Thanks. This was bought last minute as an extra favor and it arrived within 3 business days. Super easy to place labels on matchbox, looked very classy. Neat favor, especially for the price! Thanks nicepricefavors.com, we will be back! I am happy with the matchboxes. They were as pictured and were received in a timely fashion. I searched everywhere for cheap matches and this as the best deal I could find. Putting all the stickers on kind of sucked but that's pretty minor. The matches and boxes are good quality too. These are so cute and neat. I love them, and very cheap!